A stunning image of a massive bloom of phytoplankton off the Chatham Islands (to the east of NZ — that’s Wellington and the Wairarapa in the top left corner), snapped by NASA’s Aqua satellite on December 5th and featured this week at NASA’s excellent Earth Observatory. Click on the image to see the full (4MB) image with lots more detail. 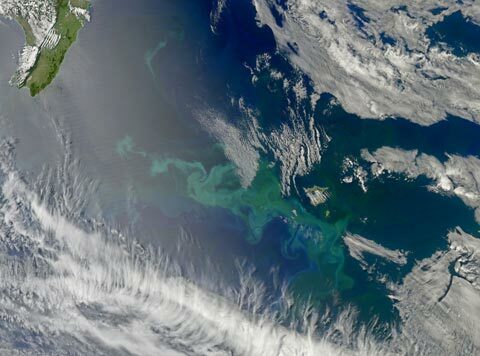 NASA describes the region as a carbon sink, because the mixing of cold but nutrient rich deep water from Antarctica, with warm nutrient-poor (but iron-rich) sub tropical water provides the perfect recipe for large phytoplankton blooms — especially in spring and autumn. A major constituent of these blooms is usually huge numbers of coccolithophores, an important component in the oceanic carbon cycle, as I pointed out the last time the Chathams featured on the Earth Observatory.